For Hendrik Goltzius, the greatest printmaker of the day, his most Mannerist phase under the influence of Spranger only lasted for the five years between 1585, when he engraved his first print after one of the Spranger drawings brought from Prague by Karel van Mander, to his trip to Rome in 1590. The group known as the "Haarlem Mannerists", principally Goltzius, van Mander, and Cornelis van Haarlem was matched by artists in other cities. Joachim Wtewael, who settled in Utrecht after returning from Italy in 1590, drew more influence from Italian Mannerists than from Prague, and also continued to produce kitchen scenes and portraits alongside his naked deities. Unlike many, notably his fellow Utrecher Abraham Bloemaert, once Wtewael's repertoire of styles was formed, he never changed it until his death in 1631. Flemish mannerism refers to a movement within North European mannerism. The painter and engraver Frans Floris (c. 1517-70) was the leading representative of Flemish mannerism. Born in Antwerp, he trained under Lambert Lombard in Lüttich, before continuing his studies in Italy, as was typical for painters during the 16th and 17th centuries. After returning to Antwerp, he founded a successful workshop in the 1550s, where artists such as Philip Galle, Cornelis Bos and Cornelis Cort, reproduced his work in etching form. Frans Floris’ work possessed the typical stylistic characteristics of Southern European mannerist art; extended, slim figures and limbs, proportionally small heads, and the use of strong chiaroscuro. Other important representatives of Flemish mannerism included Jan Mandyn, Marten de Vos and Otto van Veen. Frans Floris' older brother, the sculptor, decorator, and architect Cornelis Floris (1514-75), had a decided impact on architecture. He developed a new, rich system of decoration from a series of ornamental forms such as cartilage, gargoyles, tendrils, volute, scrollwork and ears, decorating buildings with them in an imaginative way. This "Floris" style spread rapidly throughout Northern Europe in the etchings of Hans Vredeman de Vries . The key work executed in the Floris style, was the Antwerp City Hall , built between 1561 and 1565. Landscape painting was recognised as a Netherlandish speciality in Italy, where several Northern landscapists were based, such as Paul and Mattheus Brill, and the Germans Hans Rottenhammer and Adam Elsheimer, the last an important figure in the Early Baroque. Most still painted Netherlandish panoramas from a high view-point, with small figures forming a specific subject, but Gillis van Coninxloo followed the earlier Danube School and Albrecht Altdorfer in developing the pure and "close-up" forest landscape in his works from about 1600, which was taken up by his pupil Roelandt Savery and others. Bloemaert painted many landscapes reconciling these types by combining close-up tress, with figures, and a small distant view from above to one side (example below). Paul Brill's early landscapes were distinctly Mannerist in their artificiality and crowded decorative effects, but after his brother's death, he gradually evolved a more economical and realistic style, perhaps influenced by Annibale Carracci. Karel van Mander is now remembered mainly as a writer on art rather than an artist. Though he endorsed the Italian hierarchy of genres, with history painting at the top, he was readier than Vasari and other Italian theorists (above all Michelangelo, who was brusquely dismissive of 'lower' forms of art) to accept the value of other specialized genres of art, and to accept that many artists should specialize in these, if that is where their talent lay. Specialization of many artists in the various genres was well advanced by the end of the century, in both the Netherlands and Prague, exemplified by Bruegel's two sons, Jan and Pieter, though it was also typical of the period that they both had more than one speciality during their careers. Although landscapes, scenes of peasant life, sea-scapes and still-lifes could be bought by dealers for stock, and good portraits were always in demand, demand for history painting was not equal to the potential supply, and many artists, like Cornelius Ketel, were forced to specialize in portraiture; "artists travel along this road without delight", according to van Mander. The Mannerist painters in the now permanently-separated southern provinces of Habsburg Flanders in fact were less influenced by Prague than those in the United Provinces. They had more easy access to Italy, where Denis Calvaert lived from the age of twenty in Bologna, though selling much of his work back to Flanders. Both Marten de Vos and Otto van Veen had travelled there; Van Veen, who had actually worked in Rudolf's Prague, was the founder of the Guild of Romanists, an Antwerp club for artists who had visited Rome. They were more conscious of recent trends in Italian art, and the emergence of Baroque style, which in the hands of Van Veen's pupil from 1594-98, Rubens, would soon sweep over Flemish art. In religious works, Flemish artists were also subject to the decrees of the Council of Trent, leading to a reaction against the more extreme virtuosities of Mannerism and to a clearer, more monumental style akin to the Italian maniera grande. 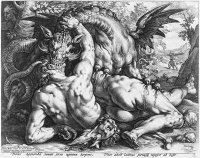 Hendrik Goltzius (1558-1617) - the leading engraver of the period, and later a painter in a less Mannerist style. Hans Vredeman de Vries (1527 – c. 1607), architect, ornament designer, who wrote on garden design. Unless indicated otherwise, the text in this article is either based on Wikipedia article "Mannerism in the Low Countries" or another language Wikipedia page thereof used under the terms of the GNU Free Documentation License; or on original research by Jahsonic and friends. See Art and Popular Culture's copyright notice. This page was last modified 09:21, 23 September 2012.